American Glass Machinery is a manufacturer of glass machinery primarily serving in the flat glass industry. American Glass Machinery is an experienced manufacturer and is widely recognized in both United States and global glass markets for both new and used glass processing machinery. The American Glass Machinery product line offers a broad range of glass machines with different functions fit to meet your needs and requirements. EquipNet is constantly receiving used American Glass Machinery equipment through our exclusive contracts with our clients. Our inventory of used American Glass Machinery equipment includes glassware washers and dryers, glass cutters, and more. If you do not see the used American Glass Machinery equipment you are looking for, call one of our representatives and we will find it for you. We can also source the right tooling and change parts that you need through our huge network of corporate clients from around the globe. American Glass Machinery glassware washers and dryers are well known for both quality and reliability in the flat glass industry. 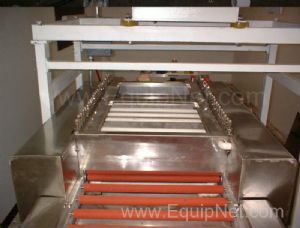 EquipNet carries used American Glass Machinery equipment ready to meet your needs and requirements.